Is Ford Motor Company (F) a Good Stock To Buy? Is Ford Motor Company (NYSE:F) a good equity to bet on right now? We like to check what the smart money thinks first before doing extensive research. Although there have been several high profile failed hedge fund picks, the consensus picks among hedge fund investors have historically outperformed the market after adjusting for known risk attributes. It’s not surprising given that hedge funds have access to better information and more resources to find the latest market-moving information. Ford Motor Company (NYSE:F) was included in the 13F portfolios of 32 investors tracked by Insider Monkey at the end of September. The company witnessed a slight increase in support from smart money investors during the third quarter, as there had been 31 hedge funds bullish on Ford at the end of June. At the end of this article we will also compare Ford to other stocks including Kimberly Clark Corp (NYSE:KMB), The Southern Company (NYSE:SO), and American Tower Corp (NYSE:AMT) to get a better sense of its popularity. Keeping this in mind, we’re going to take a peek at the recent action regarding Ford Motor Company (NYSE:F). During the third quarter, the number of funds tracked by Insider Monkey that held long Positions in Ford Motor Company (NYSE:F) inched up by 3% to 32. 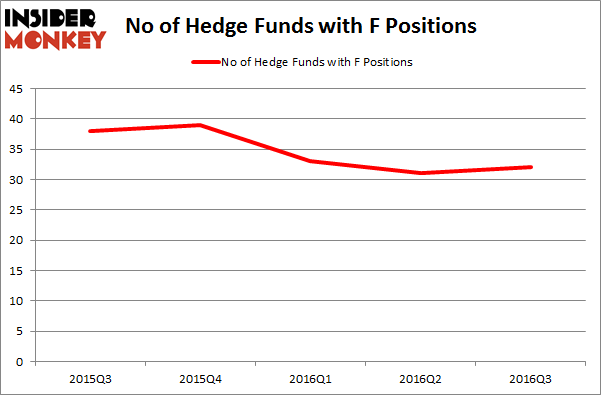 With hedge funds’ sentiment swirling, there exists a few noteworthy hedge fund managers who were upping their stakes significantly (or already accumulated large positions). Of the funds tracked by Insider Monkey, Richard S. Pzena’s Pzena Investment Management holds the largest position in Ford Motor Company (NYSE:F). Pzena Investment Management has a $210.3 million position in the stock, comprising 1.3% of its 13F portfolio. The second largest stake is held by Ric Dillon’s Diamond Hill Capital, with a $146.5 million position; the fund has 0.9% of its 13F portfolio invested in the stock. Other professional money managers with similar optimism include Phill Gross and Robert Atchinson’s Adage Capital Management, Cliff Asness’ AQR Capital Management, and David Harding’s Winton Capital Management.